We have a brief mention in the Fitchburg Sentinel and Enterprise article about the 5th Annual Forge-In. Carl placed second in the Open (professional) division this year. We got a pleasant mention in the Boston Sunday Globe Travel section (page M3 in the paper edition). New page: PHF at the Blackstone Valley Celtic Festival. Pictures! Text! Animation! Woo-Hoo! We got a little bit of media coverage on the front page of the local paper today. A fairly decent article with no important errors in it. It's been a year (and a little) since we opened and that deserves a celebration. Set aside the evening of Saturday May 17 and come visit. The Staff Gallery is easier to peruse, and some of the items now actually have prices on them. The Student Gallery will get a similar treatment sometime soon. It is now possible to peruse our class offerings easily, quickly, and succinctly. Alphabetically by name, by category, or by month. Just click 'Classes' in our new slim, trim menu. Finally a bit of interactivity here. The comments page is now up and ready to take your input. 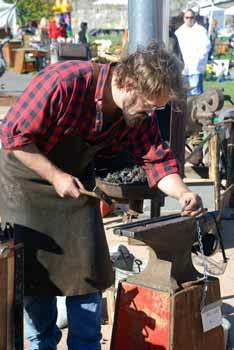 This is a place to comment on a class, look for others to form up a specific class, and share smithing tips, tricks, and experiences. The Forge-In went well. The weather was just about perfect and there was a good crowd of spectators. We needed more smiths. (Perhaps we can field a few from PHF next year.) It was interesting to work with a fairly well defined goal and a very defined time limit. With an audience. It was a little nervous-making, but it was fun. Check the Products page for pictures of the Suffolk latch. Erica, a major Fitchburg booster blogged about the Forge-in and the day in general, and was kind enough to send along a few pictures. The Sentinal and Enterprise article was pretty good (click the link then scroll down or search for "forge-in"). The TELEGRAM & GAZETTE ran an article too.